Toonces became a star in the early 90’s. He was a loveable cat that drove the family car on the NBC TV series Saturday Night Live. 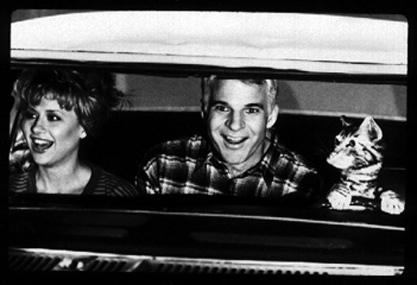 Toonces was the pet cat of Lyle and Brenda Clark (Played by Steve Martin and Victoria Jackson in the first sketch). At first, the Clarks were amazed and astonished by Toonces ability to drive a car. It always turned out to be too late before the Clark’s realized Toonces was actually a horrible driver. Each Toonces sequence always ended in screams of horror as the car plummeted off a cliff. Below are some of Toonces best clips. Enjoy! Toonces has a ride on the wheel of the car! Tounces and the lizard’s tail. The cats can play ping-pong! And over the hill they go! No licenses to drive for Toonces! Some information and pictures of Toonces. Toonces the Driving Cat information. Best of Toonces and some friends too. Floonces the drunk gets caught drinking and driving!